Two of college football’s most pleasant surprises of 2015 have resided in the state of Florida. While rival UCF was a dismal 0-12, South Florida bounced back from a 4-8 campaign to go 8-4, which included a beatdown of then No. 22 Temple. After going a combined 11-13 over the previous two seasons, Florida already has 10 wins and will have a chance to claim the SEC crown next week against No. 2 Alabama. But when all was said and done during the 2015 regular season, the team to beat in the Sunshine State was still the Florida State Seminoles. Despite having the worse record and being the lower ranked team, the Seminoles went into Ben Hill Griffin Stadium on Saturday night and did something no other visitor had done this season. They won. It wasn’t a thing of beauty, but the FSU defense shut down one drive after another throughout the early parts of a 27-2 drubbing. Freshman safety Derwin James and defensive ends DeMarcus Walker and Josh Sweat all kept constant pressure on Florida quarterback Treon Harris while senior linebackers Terrance Smith and Reggie Northrup each finished with nine tackles. For a third time in three trips to Gainesville, the FSU defense took a shutout into the final quarter. The Gators got on the board with an improbable safety with under nine minutes to play, but after yet another stop by the FSU defense, running back Dalvin Cook put a slow start behind him to bury the Gators with fourth quarter touchdowns runs of 15 and 29 yards. The lone FSU touchdown through three quarters came on a 4th-and-goal from the 1-yard line as starting quarterback Sean Maguire, who was making just his second career road start, scrambled right before finding Jeremy Kerr through a tight window for a touchdown. When all was said and done, FSU had put together its most complete road performance of the season as head coach Jimbo Fisher improved to 7-1 against SEC programs, including 5-0 away from Tallahassee. As for Cook, his record-breaking season has come largely at the expense of in-state opponents. Prior to finishing with 183 yards on Saturday night, Cook put up 266 yards and three rushing touchdowns against South Florida on September 12th and 222 yards rushing and three total touchdowns against Miami on October 10th. His 266-yard rushing performance in a 34-14 Week 2 win over the Bulls was the second best day for a Seminole back ever behind only Greg Allen, who rushed for 322 yards against Western Carolina in 1981. Against Miami, Cook broke the hearts of fans in his hometown, finishing with 269 yards from scrimmage, which included his only career receiving touchdown. The back-breaker came with 6:44 to play as Cook put the Seminoles ahead for good with a 23-yard touchdown run as FSU beat Miami for a sixth straight time, 29-24. With more than 1,600 yards rushing and 19 total touchdowns, Cook has shattered Warrick Dunn’s single-season FSU rushing record set in 1995. Victories over USF, Miami and Florida have turned out to be three of the more impressive of FSU’s 10 wins this season. While South Florida and Florida have witnessed significant improvement, Miami has quietly had a decent year despite dismissing head coach Al Golden in late October. Three of Miami’s four losses have come to teams currently ranked in the top 15 and the Hurricanes have notched impressive road wins over Duke and Pittsburgh. 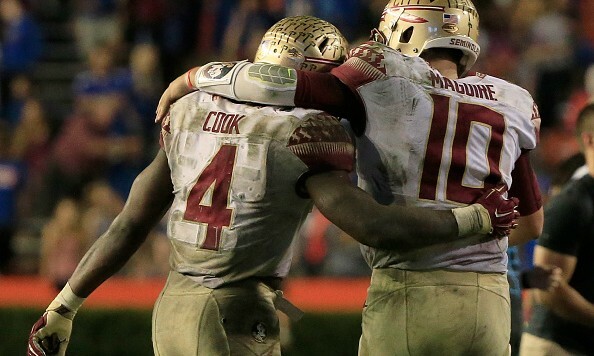 The 2015 season for Florida State has certainly been one of ups and downs. FSU suffered a gut-wrenching 22-16 loss at Georgia Tech on October 24th as the Yellow Jackets won by returning a blocked field goal 78 yards for a touchdown as time expired to pull the upset. The Seminoles lost the final quarter against Clemson on November 7th as the No. 1 Tigers came away with a 23-13 victory to end FSU’s streak of three consecutive ACC titles. The transfer of quarterback Everett Golson, who played at Notre Dame last season, turned out to not have the significance that many had hoped as the Seminoles turned to Sean Maguire for good just over two weeks ago. While that venture into the unknown wasn’t a home run, the FSU defense that had to deal with losing four starters early to the NFL Draft has improved significantly. FSU is the only team in the country yet to allow 25 points in any game. While Cook, cornerback Jalen Ramsey and kicker Roberto Aguayo were all snubbed for national awards, defensive coordinator Charles Kelly has been named a candidate for the Frank Broyles Award as the nation’s top assistant. In his second year running the defense, FSU has improved in virtually ever area — perhaps most notably sacks. It’s a forgone conclusion that Florida State won’t be playing for a national championship this season or even an ACC title for that matter, but what the Seminoles have been able to accomplish this year is nothing short of amazing. FSU has had the misfortune of having to replace a Heisman Trophy winning quarterback in Jameis Winston, a Mackey Award winning tight end in Nick O’Leary, the school’s all-time leading receiver in Rashad Greene, four starters on the offensive line and four defensive starters who declared early for the NFL Draft with all being selected in the first three rounds. With a mix of youth and inexperience, the Seminoles have managed to win 10 games for a fifth time in six years. A New Year’s Six bowl remains in play for FSU as does a fourth straight top-10 finish. Saturday’s trouncing of the rival Gators also showed that Florida State is still the standard when it comes to college football in the state of Florida. What the Seminoles have been able to accomplish in 2015 is what many programs would call a banner year. What’s scary is that for Fisher and FSU, it’s being called a rebuilding year.